It's snowing, school was cancelled (again), and I couldn't go back to sleep because of the great news I have to share with you. My heart is doing a happy dance. I'll cover the news in a short post this morning, and I'll be back later this week to share more news. 1. Imara made it to the US and is receiving great care at Cox Hospital in Missouri. Praise God! She is doing really well considering everything she has been through. 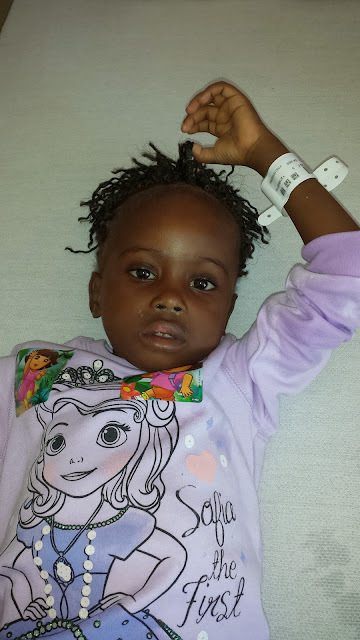 You can read about her trip to the states, her progress and her prognoses here. If you are unaware of Imara's situation and the obstacles she faced in DR Congo, you can read up at abicongo.blogspot.com or get more info here. 2. Some selfish great news: We got some video of Sweet C from people who traveled to visit their little boy who was in the same orphanage. I can't even tell you how fun it is to see her in action. She is the SWEETEST! One of the videos includes her sitting and smiling, when all of a sudden a balloon pops and she jumps and looks surprised, but she doesn't cry. I have watched it over and over because she is just so cute; I can hardly handle it. The little boys who live with her definitely love her and the other baby there, and I even got to hear them say her name a few times. It is so beautiful when they say it. **In adoption news, we are still waiting to hear that we have passed court. This usually takes 2-8 months, and I believe we are in month 3, so HOPEFULLY we get that news sooner rather than later. Once that happens, we will be able to file an I-600, which will begin the process of a rather lengthy investigation completed by the US Embassy in Kinshasa. If Brad or I travel to physically hand them our paperwork, it could drop 2 months from the timeline, making it 3-8 months instead of 5-10. However, it would be an expensive trip, and I'm not sure that it would be beneficial since DGM isn't issuing Exit Letters right now. The traveler could go visit C, though, which would be amazing but also heartbreaking to leave her. 3. We got a Lifesong Empowered to Connect scholarship for the upcoming conference in STL. This means they will pay for our admission to the conference and give us a bit of money for a hotel. Yee-haw! Only small problem is that Bradlee is supposed to coach that Saturday, so we will see how this plays out.